First Line: With an audible sigh, Rose Lane rolled the letter out of her Underwood typewriter and signed it --Much love as always, Rose. In 1928, Rose Wilder Lane packed her belongings and left Albania-- a place she loved-- to return to the Missouri Ozarks to check on her aging parents. Her father, Almanzo Wilder, was 71; her mother, Laura Ingalls Wilder, was 61. They needed help, and Rose felt obligated to stay and get things straightened out. But when the Crash occurred Rose's investments were wiped out, and there was no longer much money to be made writing magazine articles. This was when her mother Laura started writing about her pioneer childhood, and a collaboration was formed that has bewitched thousands upon thousands of readers to this day. A Wilder Rose is written from Rose's point of view. She's a world traveler, a journalist, and a highly paid writer for all the best magazines of the day. Growing up poor, always having to "make do," being ridiculed at school-- all this and more made Rose want to be more, to do more, and she did. When she returns to the Ozarks and becomes trapped by lack of money, her pain is palpable as she tries desperately to gather up the funds needed for both her parents and herself to have the lives they deserve. I can see some readers not liking this book because Albert doesn't write the fairy tale that they have grown to love. Laura isn't the adorable little Half Pint in this book; she's an older woman who's experienced many hardships and heartbreaks, and she's much more real as a result. Laura Ingalls Wilder was not an easy woman to live with, and the stories she wrote about her childhood were far from being publishable. Rose was the true writer in the family, and she knew what needed to be done to a manuscript to make it marketable. Countless battles of will occurred with the birth of each of the Little House books, and the entire process is fascinating to read. Albert also does a masterful job of portraying the period itself: how the stock market crash affected people, what life was like during the Dust Bowl. The political and social conflicts of the time come to life. I was amazed at how similar those conflicts are to the ones we are experiencing today. 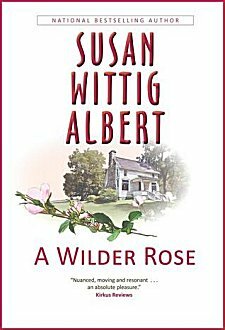 Susan Wittig Albert walks a fine line in A Wilder Rose, and she does it very successfully. While the Laura presented here isn't the lovable little tyke of the books so many people like me grew up reading and loving, the portrait of the older Laura is a realistic and utterly believable one. However, the author shines at letting us see the real Rose Wilder Lane and hear her voice. Rose's story is one that forcibly struck home with me. It was expected that Rose would give up her life, give up the person she was, give up so many of the things she loved to do, to go home and take care of her parents as their health declined. The exact same thing was expected of me when my beloved grandfather's health declined. I understood her love for her parents, her feelings of guilt and of being ripped in two. A Wilder Rose succeeds beautifully on so many levels: as a social history of the times, as the story of the collaboration of two dissimilar women to create one of the most beloved series of books in America, and as the story of a woman trying to uphold her familial obligations while being true to herself. It's a book that I found hard to put down, and it's a book that's made me see that Rose Wilder Lane deserves to be given credit for all the work she did in creating those little houses. Cathy - What a fascinating book!! Like many young people I grew up with the Little House books and so did my daughter. We even went to see both De Smet, SD and Mansfield, MO. I will definitely have to check this out. I really think you'll enjoy it, Margot. Rose lived in Danbury, CT during WW II and I lived near Danbury in the 60s. I discovered material about her in the library and wished I could write a book about her. I wasn't convinced that mother and daughter were real collaborators. The issue is quite controversial. During the war she was a demon on a mission. She attempted to be self-sufficient with her Liberty Garden and, if I remember correctly, a cow. She refused to pay taxes because she wouldn't have her money used for war. As she aged, she became a real hellcat and was remembered in Danbury as a crackpot. I need to read this book to get the other side of the story. I'd read in other sources that Rose cut quite the figure. You can see glimpses of it in Albert's book. I'm so glad you liked this book, Cathy. I bought it from Kindle as soon as I saw it mentioned on Scene of the Crime but I haven't had had a chance to 'crack' it yet. I was somewhat aware of Rose's role in the Little House books but I'm eager to hear more details. Thanks again for putting me onto this! You're welcome, Debbie. I'd read bits and pieces over the years about Rose's involvement in the books, so I really appreciated reading this.